Choi Hye-jin added a 69 at Mayakoba El Camaleon to give South Korea a 13-under 275 total, with only the best two scores counting each day for the three-player teams. Park Hyun-kyung had a 75. Choi topped the individual standings at 5-under 139, a stroke ahead of Denmark's Puk Lyng Thomsen. Thomsen had a 67 on the Iberostar Playa Paraiso layout. 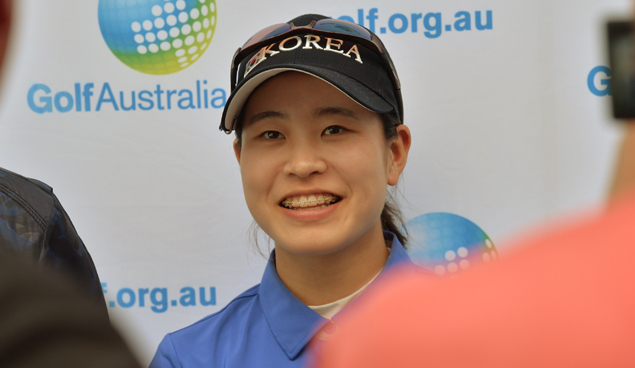 The 16-year-old Park Min-ji, the Australian Amateur champion, had six birdies and two bogeys. First-round leader Switzerland was second, with Kim Metraux shooting a 72 and sister Morgane Metraux adding a 73. The sisters are teammates at Florida State. Ireland was third at 1 under, with Duke junior Leona Maguire leading the team with a 70. The United States was tied for seventh at 3 over. Katelyn Dambaugh had a 72, and Mariel Galdiano and Andrea Lee each shot 73. South Korea won the Espirito Santo Trophy in 1996, 2010 and 2012.